Volvo has begun production of a battery-powered version of its C30 hatchback and will offer the first cars to leasing customers in Europe. 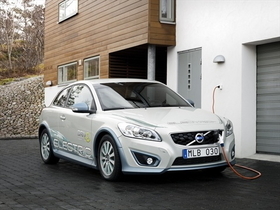 Deliveries of the C30 EV would begin after the summer to company fleets and governmental organizations throughout Europe, Volvo said. Volvo is building the C30 EV at its Ghent factory in Belgium, before the motor, batteries and other model-specific electronics are fitted in Gothenburg, Sweden. The vehicle has a range of 150 km (93 miles) on a full charge and can reach 130 kph (81 mph), according to Volvo. The automaker claims that the vehicle takes around seven hours to reach a full charge from a regular household power socket. Volvo has been testing around 50 C30 EV cars since last year in Sweden and plans to build 250 cars by the end of 2012.